Blowfish saving blowfish. Your friend is trapped in a wooden cage and there are convenient platforms all over the place. Launch, slide, and push yourself over and free your friend before uh, it gets turned into Fugu? I dunno. It doesn’t matter. Blowfish are in trouble. Just go get them! Banzai Blowfish is a universal iPhone app by Red Piston Inc. You can pick up this physics-based puzzler/platformer for $1.99. So let’s see what we have. 5 different themes of Rocks, Snow, Night, Water, and Volcano. 40 different levels of increasing difficulty. Hand drawn graphics with some pretty nice designs. And promises of lots more updates with lots more stages and levels. You can share your score through Facebook, twitter, and through emails and this app is supported by Game Center. That’s a lot of pretty good stuff. Too bad I still really have a bad taste in my mouth. Banzai Blowfish is yet another victim of its own mistake. Reading the App description and many of the questionably positive comments, Banzai Blowfish makes one thing very clear: It’s comparing itself to Angry Birds. You don’t compare yourself to your rivals. Why? Because if you make a product that is even slightly flawed compared to your competition, then you make those flaws a million times more glaring. Normally forgivable elements suddenly become ironic and sad. Angry Birds is THE top paid game in the AppStore (at the time of writing). There is no reason to even mention them in your app. Angry Birds, which I personally don’t have much interest in, is still a faster, less frustrating, killer app. In Banzai Blowfish, your main blowfish catches on objects and the corner of platforms all the time. Momentum and movement feels random since sometimes you’ll drift forward and other times you’ll just sit still. I still don’t know how to control it and sometimes it can get me killed. You will fall off platforms because of pure luck and replaying with only a miniscule difference in your strategy will suddenly cause you to be successful. I kept feeling like the game was just letting me succeed when it felt like it. 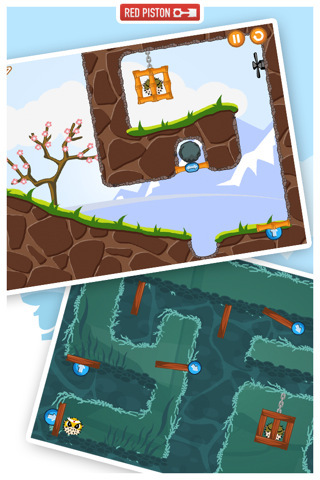 If you play a few levels of this game you’ll also notice that this has NOTHING to do with Angry Birds. 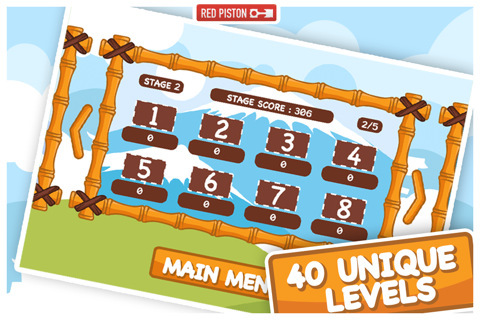 Angry Birds is a game of shooting and trying to knock down a house of cards essentially. This game is about platforming, careful timing, and reaching the end of the stage. These two games have no relation to each other and the comparisons that Red Piston keeps making is just pushing me to support Angry Birds even more. Don’t get me wrong. Blowfish is not a bad game app. It’s an arrogant one that ruined itself by comparing itself to something better. It’s like those Mac vs PC commercials. Ok, Macs are good computers and has a strong following. Now if you’d stop comparing yourselves to PCs and making commercials specifically insulting them, maybe you’ll sell more and reduce the feeling of arrogance. You aren’t converting any PC users because now they hate Macs even more. You aren’t convincing current Mac owners of anything because they already own and will probably keep with your product… so what are those marketing campaigns only purpose? To make yourself look incredibly insecure and immature. Good job. (Before you rage, I own both a PC and a Mac and I feel both are pretty good with both having flaws and uses. Banzai Blowfish. Red Piston. If you want to look better, take down all references to a better game. You will lose. You will make yourselves look bad. And you will piss off users by tainting their experience with your game thanks to your petty competition and raise their expectations too high for you to actually hit. Your game is fairly average and can use some major improvements to gameplay and marketing presentation. It could also use more excitement in gameplay. Maybe a time pressure system like a monster that will eat your friend if you don’t get to them fast enough… but only after you fix how loose and hard to control your Blowfish is. AppSafari review of Banzai Blowfish! was written by Joseph Ho on March 8th, 2011 and categorized under App Store, Games, iPad apps, Physics Based, Platformer, Puzzler, Universal. Page viewed 3499 times, 4 so far today. Need help on using these apps? Please read the Help Page.